Here is another good news to those who wants to work as domestic helper or household service worker in Singapore but do not have enough money for the processing of their documents and other requirements. Employers in Singapore that hoping to hire domestic workers from the Philippine can now lend them up to $1,100 SGD or more than P38,000 to cover their expenses. In return, the DH will pay the loan only up to half of their monthly salary until fully paid. According to Association of Employment Agencies President K. Jayaprema of Singapore, this is base on the new payment structure that provides more clarity for workers and employers. The new payment structure takes effect immediately. The DH will decide how to use the cash advance. The loan can be provided by the employers, agents or other institutions. Jayaprema said they found out that the preparation cost for a DH to work in Singapore is around $1,100. Included here are charges for pre-employment training, medical examination, passport fees and etc. 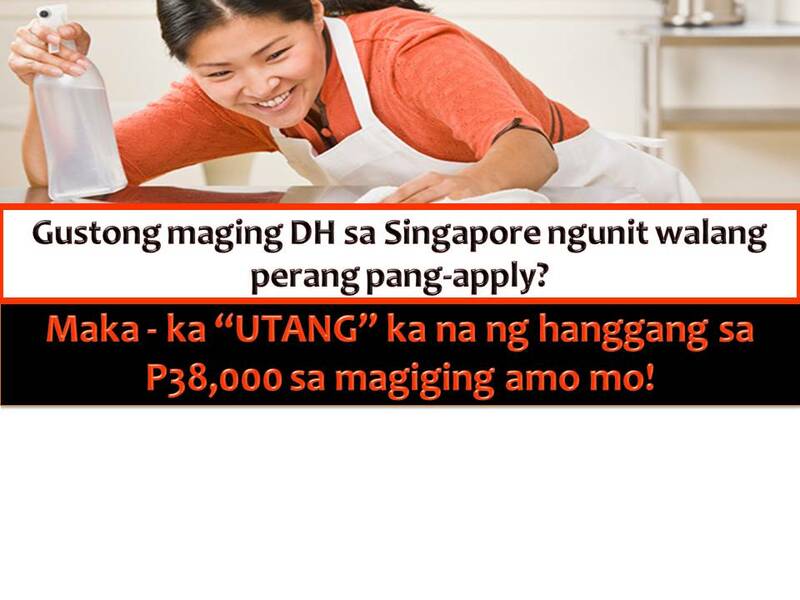 As of the moment, there is approximate, 70,000 Filipino domestic helpers in Singapore. Philippine Embassy labor attache Ramon Pastrana reminded that it is illegal for Filipino domestic workers to be charged with placement fees to work abroad. "This initiative is not a reason for agencies here to just go charge any salary deduction from the worker," he said.